A common treat during winters,this halwa is to die for. It can be made in many ways ,what I am going to share is traditional slow cooked method of making Gajar halwa. 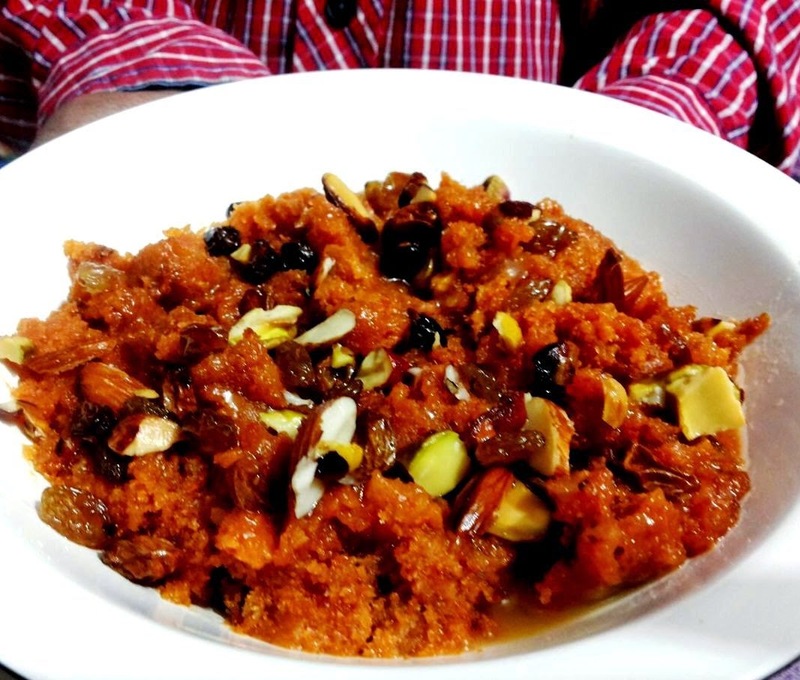 YUMMMMMM...my mouth is watering even when I am writing about it.The most important part of Carrot halwa is that carrots should not remain raw but should get cooked thoroughly while incorporating flavours of milk,sugar and ghee(clarified butter). Wash,peel and grate the carrots. In a deep thick bottomed pan,add ghee.Then add milk and grated carrots to the pan. On low heat,bring the whole mixture to boil. Let the mixture simmer for around 45 minutes. When the milk is 90% reduced,add sugar to the pan. Keep stirring on low heat so that milk and sugar are completely incorporated. Add cardamom powder and simmer for 10 minutes. Meanwhile take another small pan.add ghee to it and roast cahew nuts,almonds and raisins in it. At the end,add cashew nuts,almonds and raisins to the pan of carrot halwa and let it simmer for some time.Take it off heat and serve it hot or cold as per your taste.